Workshops, activations, performances & activities based on instructions by 70 artists. Darat al Funun, Amman, until Mid-January 2017. Co-curated by Sharjah Art Foundation Director Hoor Al Qasimi and Serpentine Gallery co-Director Hans Ulrich Obrist, do it بالعربي is a new iteration of the ongoing publication and exhibition project originally founded and curated by Obrist in 1993. For do it بالعربي more than 70 artists from across the region have written instructions that anyone can use to make a new work of art. 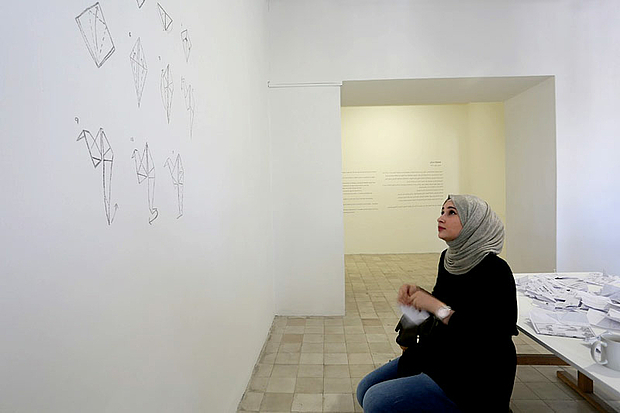 First realised at Sharjah Art Foundation in January-April 2016, then at Al Riwaq Art Space in Bahrain in July - August, the exhibition opened Darat al Funun in Amman on 24 September showcasing a selection of these instructions realized over the summer at Darat through collaborations with artists, architects, and students, as well as many others. do it بالعربي features art work instructions by artists from ten countries in the region, including Basel Abbas and Ruanne Abou-Rahme, Hamra Abbas, Mohamed Abdelkarim, Adel Abdessemed, Adel Abidin, Sarah Abu Abdallah, Etel Adnan, Tarek Al Ghoussein, Sophia Al Maria, Jaffar Al Oraibi, Mohammed Al Qassab, Nasser Al Salem, Mounira Al Solh, Mustapha Akrim, Rita Alaoui, Khalid Albaih, Manal AlDowayan, Rheim Alkadhi, Abdullah Al-Mutairi, Ziad Antar, Rasheed Araeen, Tarek Atoui, Samira Badran, Ismaïl Bahri, Lara Baladi, Dia Batal, Taysir Batniji, Doris Bittar, Ali Cherri, Ayman Yossri Daydban, Róza El-Hassan, Fouad ElKhoury, Safaa Erruas, Fadlabi, Simone Fattal, GCC, Abdulnasser Gharem, Joana Hadjithomas and Khalil Joreige, Aya Haidar, Hazem Harb, Mona Hatoum, Susan Hefuna, Khaled Hourani, Hasan Hujairi, Kamala Ibrahim Ishag, Mohammed Kazem, Yazan Khalili, Hassan Khan, Ahmed Mater, Hassan Meer, Amina Menia, Magdi Mostafa, Joe Namy, Nasir Nasrallah, Amir Nour, Khalil Rabah, Khaled Sabsabi, Abdelraheem Salim, Jayce Salloum, Hrair Sarkissian, Zineb Sedira, Sam Shalabi, Hassan Sharif, Suha Shoman, Nida Sinnokrot, Rayyane Tabet, Jorge Tacla, Jalal Toufic, Sharif Waked, Raed Yassin, Ala Younis, Hisham Youssef, and Camille Zakharia. A bilingual publication includes over 70 newly commissioned artist instructions, a selection of previously published instructions, as well as essays that contextualise the project. Artists from the Arab world, Africa, Asia, Latin America. Darat al Funun, 2013/2014. Curator: Adriano Pedrosa. Photo tour, including all the 29 artists.